If you are a lawyer or business professional that wants your photo to show up in Google search email me at jwojdylo@gmail.com as I offer services to assist with this process. Having a photo show up beside a Google search result definitely makes it stand out. So much so that some Personal Injury Lawyers have taken professional photos with a “loud” or “bright” background to make their search result the most appealing. Having a potential client or customer click on a search result could be the difference in getting that medical malpractice case or missing out on the opportunity to win a major settlement. Rather than allowing the competition to get ahead, it is best to jump on the Google Authorship photo opportunity in search today. There are a few steps that must be taken to make certain that a Google Authorship photo will show up in search. It is not simply click a button and hope it works. Google must verify the website and the author. This is a two way street that can get somewhat confusing to those that are not technologically savvy. 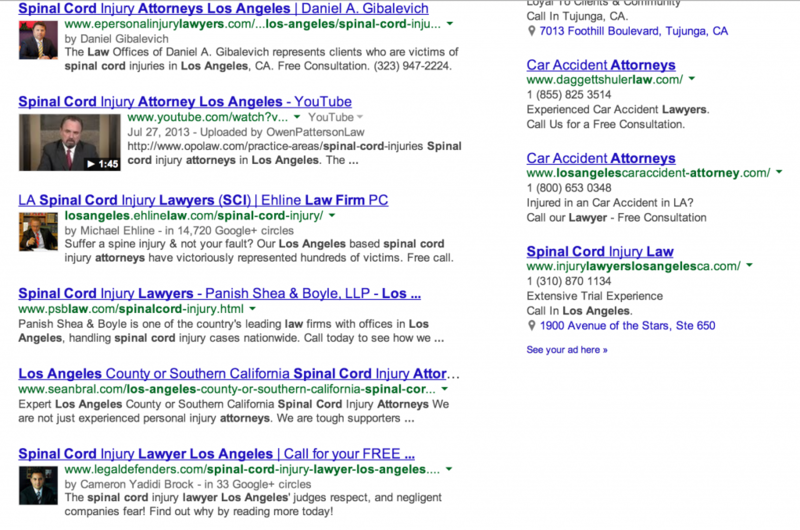 For this reason, I have started offering a service to help Personal Injury Lawyers and other professionals set up their Google Authorship photo in search properly. Feel free to reach out to me if you desire this service. When consuming this search result it is quite obvious what jumps out to the searcher. The YouTube video has the largest thumbnail but there are also three websites that have Google Authorship installed. Also notice that on two of the Authorship photos there is a byline that states how many circles that particular Author/Lawyer is in. I do not think this is the be all, end all of getting people to a website but it definitely does not hurt to be in over 14,000 circles like Michael Ehline. Something that must be stated is that the number of circles an author or lawyer is in will not determine who ranks first in Google search. Some have predicted that the more circles you are in or the more followers you have the higher your search ranking. The photo above is a perfect example in which that is not the case. That said, I definitely feel as if it will not hurt to have a large following or be in a large number of circles on Google+. You are basically telling Google you are a valuable author to Google+ users which, in turn, would likely mean you have valuable resources that show up in Google search. There are a number of ways to install Google Authorship on a WordPress website or blog. By doing some digging for plugins most people will find plenty of opportunities. I would always read some of the reviews and ask your friends that have used a particular plugin. It is sometimes worth it to ask others within the legal industry what plugins they use to make Google Authorship easier. The fact that Authorship is changing every day means some of these plugins are going to become outdated quickly. For this reason, I would suggest using the Google code that is offered. To get your Google+ ID code simply right click on your profile photo anywhere within Google+ and go do to copy link address. When you past the link address it will conclude with your Google+ ID code. If you have a vanity URL it has been stated that Google Authorship will work but I prefer to use the 21 digit code. If this is foreign to you it would be best to hire someone that knows what they are doing. When using this code, you can install it in the between the head and body section of the header or you can simply past the code in each WordPress blog post in the HTML at the top of the article or resource. If you are a single author on a website and you never plan on having guest authors you can save a significant amount of time and money by just place the aforementioned code in the header section on the WordPress Editor. If you are not using a WordPress website you will still be able to insert the code into a header section. If you want the authorship to show up on every new blog post or resource created you need to be 100% certain the code is in the header as there is a header on every single page. If you are not a coder or you do not understand the coding of a website it might be best to not mess with it. From personal experience, I can tell you that simply taking out a / or > you can mess up an entire website. Next think you know the website is down, Google cannot crawl it, you are unable to publish new content and you are back to square one. Don’t do this to yourself as it is simply not worth the stress and aggravation. Allow someone that has worked with WordPress website or coding for thousands of hours to add the Authorship to your website. Can Authorship Not Show Up in Google Search? It is very important to understand that Google Authorship is not a polished product just yet. I have had authorship installed on this website since it went live and there are still articles in which the authorship does not show up at all or there is only partial authorship. Full Google Authorship is a photo in search, the name of the author and the number of Google+ circles they are in. Lately, we have seen partial authorship in which the author’s photo will not appear and sometimes the number of circles they are in will not appear. Unfortunately, there is absolutely nothing that can be done about that at this point. The only way you can know if you have installed Google Authorship correctly is to use this link. If you put the correct web address into the Google Rich Snippets tool and it states that Google Authorship has been installed correctly you are good to go. If it states that Google Authorship has not been installed correctly there needs to be some adjustment to the coding of your website. There are some email methods that can be used within the rich snippets tool but I have never had to use them as I add the coding to the HTML of the websites I use and those of my clients. If Google Authorship is installed correctly there is a high likelihood that your photo will start to show up in search as you build authority and create more content. Remember to keep pumping out great content as this helps Google to determine if you are a true Personal Injury Lawyer that is of value in the search results. If you are looking to grow a Google+ presence so you can get in more Google+ circles I have a monthly package that I offer that helps businesses, law firms and individuals. Do not hesitate to reach out to me at jwojdylo@gmail.com. I can assure you that many lawyers and attorneys are already chomping at the bit for a chance to jump ahead of their competition. Rather than allowing the competition to get ahead of you install Google Authorship now and start getting active on Google+. There are some amazing lawyer and attorney communities that will help you better use the Google social layer. If you struggle with Google Plus communities do not feel as if you are alone. It is still a product that is getting polished by Google and there are a few issues. Just recently, Google Plus finally offered moderators and owners of Google Plus communities the option to pin posts. This is something that should have been available from day one but it simply was not. I personally worked with Google employees on the product and this was a suggestion of mine in November of 2012. Now that the pin feature is available it makes it even more important to be a moderator or an owner of a community. This will allow you to push your own content as well as the best content out to community members. Something that I push with all of my clients is getting communities started in a specific niche. It is not hard to do but it does take effort. If a personal injury lawyer is willing to grow a Google Plus community related to their niche they could see amazing rewards in the future when it comes to search rankings and SEO in Google. Why College and High School Students Hate Google Plus | Does Every Google Plus Post or Update Show Up in Search?